Joined the ZPC in 1966 and remained an active and committed member for a remarkable period of 51 years. Served as president from 1992-93. Became an Honorary Member in 2011. Resigned in January, 2018, and was immediately elected to Member-Emeritus status. 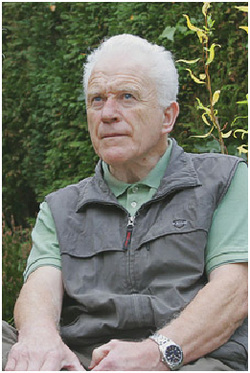 Born 1931, began an interest in birds during my early youth just watching in local parks and woodland. At 18, commenced National Service in the R.A.F. and trained as a wireless mechanic, working mainly on Lincoln bombers at Scampton, also playing trumpet in the station band. It was during this time my interest in photography began with a very inexpensive camera costing about 30 shillings. My next step into the bird world was aviculture, breeding and showing foreign birds achieving champion status. This gave me a deeper knowledge and understanding of birds but eventually I preferred to see them in their natural habitats so it was inevitable that all my time and effort would be spent on bird photography. My first photo from a hide was of a Lapwing at the nest, taken in 1958 and since then most of my work has been done this way by the use of hides varying in construction for use down a mine shaft and up to 50 feet in tree tops. Working in 35mm and 2¼ inch format in black and white medium I gained ARPS and FRPS in the late 1960s. Things have changed a little since then!